At first glance, you may think this container is brimming with a heart-clogging, cream-based dressing. A dressing that makes you feel guilty just by looking at it. But there’s no need for guilt here, my friends. Go ahead and drench your veggies in this stuff! Combine all of the ingredients in a blender, and blend until smooth and creamy. Add more water to thin, if desired. Serve generously over your favorite veggies, or as a delicious dip. Serve generously over your favorite veggies, or as a dip. Creamy dressings were another thing I didn’t like as a kid. Made this yesterday, stored it in the fridge overnight to let the flavors come together. Yum-o! Eating it right now and loving it. Thanks, Megan! This dressing was so tasty and easy to make. I put it on a fried portabella mushroom, cherry tomato, and green bean dish. Planning to try it on salad since there is plenty left over. I wonder how long it lasts in the fridge. Can you add balsamic vinegar to this dressing? I feel like I need to add something else besides water to make it not so thick. I LOVE it for a dip, I’m talking about for a salad dressing. 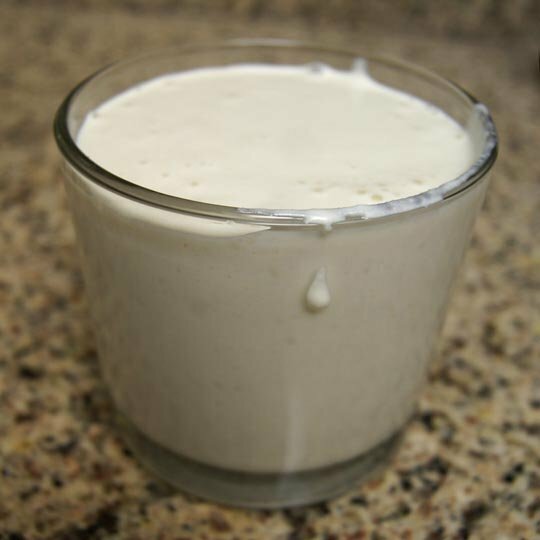 Just made this tahini with cashews (didn’t have the raw tahini on hand) and a handfull whole sesame seeds then blended in Vitamix till smooth and frothy. SOOOOOO good, I plan to wow my husband with it tonight 😉 Will be serving with roasted shawarma spiced veggies, I can’t wait for dinner! Another delicious recipe Megan, thanks!!! I love Tahini so I had to try this. I thought the Tahini taste was a little to strong so I added some maple syrup to this and it was just what it needed. Just poured it over a huge plate of veggies, delicious. I really loved this! I’ll probably add slightly less lemon for my own personal taste next time, but it was divine used as a dip for my sweet potato fries. Thank you! Love your recipes! Way too much lemon juice! This is absolutely the BEST dressing ever… I have had it with two different salads and both tasted great. I used a a small chunk of red onion as i didnt have onion powder and still came out fantastic. The salad it tasted best with was a combo of red cabbage, white cabbage, lots of mint, lots of coriander, orange carrot and lots of chives. Delish with toasted almonds. Better than Annie’s Goddess. I have been following you and making recipes that you post now for about a year. I added a little green onion. This was better than I expected. I ran out of my yogurt dill dressing I make and decided to try it. Some day I will make everything you post. This is the third time I’ve made this. I think I like it better with less garlic and more onion so I adjust it slightly. Also, I use 1 lemon, which gives me a quarter of a cup of juice (I must have large lemons!) then top that off with water to make it equal a half cup. It’s perfect! Soooooooo yummy! Do you ever make your own tahini? I give it 5 stars but for some reason it will only highlight 4 stars no matter how many times I tap the 5th one. Probably an Ipad glitch. I have recently been diagnosed with some liver problems and I can not have sodium. Do you have any sodium free receipes? Especially for sauces and dressings. Thanks! Lesa, you are always welcome to leave the salt out of any of my recipes. The results will be a bit more bland, but I’m sure your taste-buds will have adapted to less sodium flavor, anyway. Made this today, and even my 5-year old son enjoyed his salad! I added some extra herbs, so it would look like ranch dressing. Thanks! This is seriously the BEST creamy dressing! Thank you for all the yummy and healthy ideas you share with us! You should just call this dressing “liquid crack”! I will be pouring this over my salads all week. Your recipes are the BEST. Delicious & easy. I am going to try this with other nut/seed butters. Thanks for sharing. Thanks! I’ll definitely be giving this a try. What Tahini do you recommend? I definitely think the taste of the tahini makes a big difference as I have made hummus with not so great results. Would love to know which brand(s) you would recommend. Thanks! I can usually find it at my local Whole Foods, but otherwise you can order it on Amazon with free shipping! I tried finding ‘raw’ tahini at my local Sunflower Farmers Market. I only found roasted seed tahini, will that work for your recipes? I’m assuming the raw tahini comes from un-roasted, plain sesame seeds? I bought the stores brand, which didn’t say roasted, but it also didn’t say raw. 🙂 I can’t wait to try this recipe tonight, and also planning on making your goat yogurt ranch. Starting to get bored with plain lemon and olive oil dressing. Thanks for all the recipes! Megan you might laugh, but both my meals today were from the Megan Menu! I went out and bought some tahini for the first time ever. I almost fell over when I saw the total fat content but then checked the (low) saturated fat total. The media has brainwashed us to think all fat = bad. Anyway, I made this dressing for a huge salad today and I LOVED it! Thanks for all the great, healthy ideas. As far as food combining goes, is tahini under the nuts, seeds, and dried fruit category? Or is it neutral? Glad you’re enjoying the recipes!! I just made this! It tastes great! I wish I had some fresh dill and parsley to throw in it because I bet that would taste great too! try almond butter instead! It’s delicious and creamy.